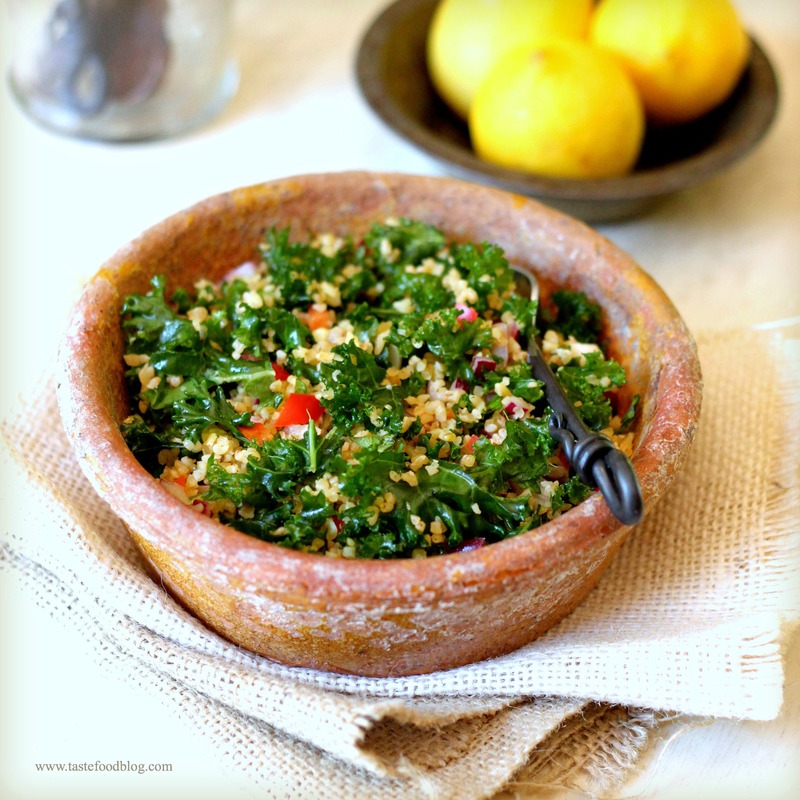 Tabbouleh is a Middle Eastern bulgur salad redolent with lemon and garlic and chockablock full of fresh herbs. It’s a great summertime meal, when it’s too hot to cook. I like to serve it as a part of a mezze or small plates, accompanied by feta, olives, and hummus. This recipe adds kale to the mix, reducing the amounts of the traditional parsley and mint, and resulting in a healthy hearty and very addictive salad. Combine the bulgur, water and lemon juice in a large bowl. Let stand until the liquid is absorbed and the bulgur is tender, about 20 minutes. Add the kale and olive oil and stir for about 1 minute to coat the kale with the oil and soften the leaves. Add the remaining ingredients and mix well. Taste for seasoning. Cover and refrigerate for 1 hour to let the flavors develop. Oh my that sounds divine..
My family rebels at eating many kale recipes. Many times I don’t even mention the kale! But the delightful Tabbouleh Salad would keep them happy! Onions, jalapenos, garlic, lemon, mint and parsley are vivid enough to tame the robust kale. A great idea! Lovely tabbouleh. Thank you again for one more recipe for kale, and anything from you I love. I like that you added kale and jalapeño to your tabbouleh…very flavorful. Talk about healthy – and when I feel lazy, I use whole wheat couscous instead of bulgar – ready in 5 minutes. I am always looking for new kale ideas for our garden kale harvest.. thank you for this! This is a lot like what I did last time I made tabbouleh. I love kale and I love the idea of adding a fresh chili for extra flavor! I’m gonna start calling you the queen of kale….LOVE this! Great take on tabbouleh, which is something I adore but don’t make often enough – I like the variation that Liz suggested with the whole wheat couscous, gotta try that sometime!